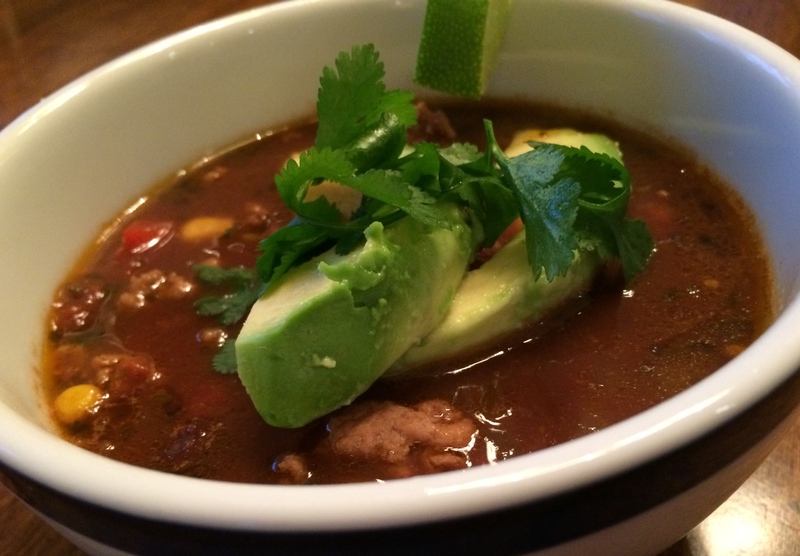 This hearty turkey chili is a perfect winter dish. There are two secret ingredients that make the dish wonderful, molasses and chocolate. It sounds funny, but if you’re game for trying something new, this is an easy and delicious soup! I slice up creamy avocado, add some fresh cilantro and a squeeze of lime juice to finish the dish. In a large heavy pot over medium heat, place 2 tablespoons of olive oil and the onion and sauté, about 5 minutes. Add the bell peppers and continue to cook another 3 to 4 minutes. Add the garlic, chili powder, and cumin and stir for another minute. Add the tomatoes, water, oregano, and chipotle pepper and bring to a boil. Reduce heat to medium-low and simmer, covered about 10 minutes. While the chili is simmering, cook ground turkey in 2 teaspoons of oil in a nonstick skillet over medium heat, breaking it up as you go, just until it loses its pink color. Drain the fat and add the turkey to the chili. along with the beans, corn, cocoa, molasses, and add salt and pepper to taste. Bring to a boil again and then simmer for another 10 to 15 minutes. Taste again for seasonings and add additional salt and pepper if needed. Remove the chipotle pepper if you’ve used it. Often I add a splash of sherry vinegar or fresh lime juice to help balance the flavors. Ladle into bowls and top with chopped cilantro, sliced avocado, shredded jack cheese or a dollop of creme fraiche. Enjoy! I can attest to how good this chili is! Very hearty, tasty, and satisfying. Pam is a great cook. Wow Looks fantastic! Perfect for this cold winter! Amazing. I cannot wait to try this one, I have used cocoa but not molasses. Was so fun to see you in the line today!!! Oh these boys all growing up on us literally and figuratively….